Chiropractic is a natural, drug-free approach to overall health and well-being. Chiropractic care adds nothing to the body and it takes nothing away. Chiropractic care allows your body to heal itself – naturally! The goal of a Chiropractor is to locate and correct disturbances to normal body function and maximize your inborn healing abilities. Chiropractors adjust the body to remove nerve disturbances (pressure on the nerves also called subluxations) to allow your brain optimal communication channels to the rest of the body. 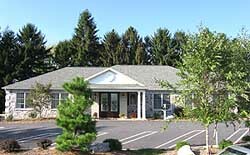 The Family Wellness Center at Briarsdale. The Family Wellness Center/LeVan Family Chiropractic began as a small ranch-style home in 1993. As demands from the community increased, we were directed to develop and construct the present facility ten years later. Our new facility is now called The Family Wellness Center and is home to numerous other health and wellness professionals including massage therapy, psychotherapy and family counseling, weight management, nutritional counseling and The Yoga Studio. Dr. LeVan uses the latest techniques and state-of-the-art equipment to maximize comfort and results so there is no “guess work” when determining what is wrong and what recommendations are required for you to return to optimal health. If you think that you or a loved one are a good candidate for chiropractic care, contact The Family Wellness Center today to arrange a thorough examination with Dr. LeVan.